There's nothing like a beach vacation for relaxing and reconnecting with family and friends. Once you have chosen the location for your beach getaway, you might think you can sit back until travel day arrives. But you're not there yet. 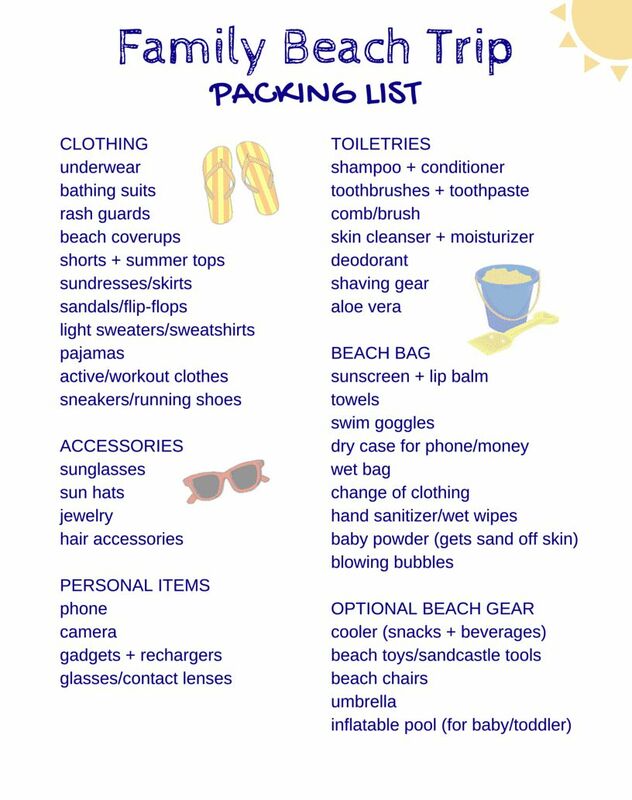 You still need to plan what you will be taking and how you'll be packing. What you choose to bring with you can help you make the most of your family vacation, and very often it's the little things that separate the beach newbies from the beach bosses. And, it's best to shop before you arrive at your destination, especially if you are traveling to a small beach community without the conveniences of home. Aside from sun protection, one of the most important things to bring on a beach vacation is foot protection. Beaches have soft sand that hides hazards like broken glass, sharp rocks, and slippery seaweed. Once in the water, you are safer if you wear a slip-on beach or water shoe to protect your feet from rocks, coral, and little water creatures. There are water and beach shoes for men and women that are stylish, practical and quick drying. For those who live inland, a beach environment may be new to you. There are important things to consider like tides, safe swimming areas and, yes, even sharks. If you'll have access to cellphone service during your beach getaway, there are apps designed especially for the beach-goer. You'll be able to get timely information on where you find the cleanest beaches for swimming, surfing, or just wading. And, for those investigating hidden coves and tide pools, an app for predicting the tides where you are staying. Use your cell phone for important things like weather updates and storm alerts so if you are likely to be in an area where electricity can go out, be sure you maintain a charged cell phone and have a backup battery or charger just in case. Think ahead and try to avoid vacationing at a beach during hurricane season. It's common to leave your things on a towel when you head into the pool or surf so make sure you think about ways to keep valuables safe at the beach, like bringing along a portable safe. You may want to take things along with you each day as you explore, swim, or relax on the beach. Waterproof totes (zippered so the sand can't blow inside is best), backpacks, or a duffel will be handy for changes of clothing, shoes, and essentials like sunscreen. Bring plastic bags for the inevitable wet and sandy things. There are some obscure things that you might consider bringing to the beach. Indispensable beach hacks include a container of baby powder (rub it on your skin and the sand will fall off easily when you leave the beach) and a shower curtain clip to keep your keys handy and safe. If you have a tiny one, an inflatable baby pool makes a handy take-along play space.